Mr. & Mrs. Izzy Green on the occasion of the birth of their daughter, Sophia. Mr. & Mrs. Allan Arnet have made a contribution to the kiddush fund on the occasion of her father, Maurice “Bud” Friedman’s yahrzeit. Mr. & Mrs. Colin Friedman on the occasion of the yahrtzeit of his mother. Mr. & Mrs. Eric Rothner on the occasion of the yahrtzeit of his father. Mr. & Mrs. Joseph Abramchik on the bas mitzvah of their granddaughter Tamar, daughter of Rabbi Yigal & Veeta Abramchik of Boca Raton, Florida. Mazel tov to the great-grandmothers, Mrs. Gerda Abramchik and Mrs. Leah Flanzer. Dr. & Mrs. Shmuel Goldstein on the birth of a grandson born to Tzvi & Jeanette in Yerushalayim. Mr. & Mrs. Izzy Green on the birth of their daughter, Sophia. Mr. & Mrs. Marc Sommer on the bas mitzvah of their granddaughter Rachel. The Stewart Sheinfeld Father and Son Learning Program continues this week at 7:00pm. This week is sponsored by Mr. & Mrs. Eric Rothner on the occasion of the yahrtzeit of his father. Pirchei will resume this week at 8:00pm Friday night. Thank you to both Joey Zimmerman and Bruce Nedwin for their assistance. The 3rd annual Cholent Cook Off is THIS Shabbos, Parshas Terumah, Feb 9th. The Chicago Police Department will be providing a training session specially for our shul greeters this Sunday, February 10th at 10:00 am at Yeshurun. We highly encourage everyone to attend this training session, even if you are not (yet) a greeter. The Police representatives will be coming on their day off so it is important that we have good showing of shul members. (If you are unable to attend Sunday’s session, there are additional sessions offered at the 24th District Station.) Please RSVP at office@adasyeshurun.com. There is someone who is in need of a Chavrusa for Kollel Boker. If you may be interested, please speak to either Eli Klein or Rabbi Cohen. The 2018 tax letters have been sent via email or mailed out. 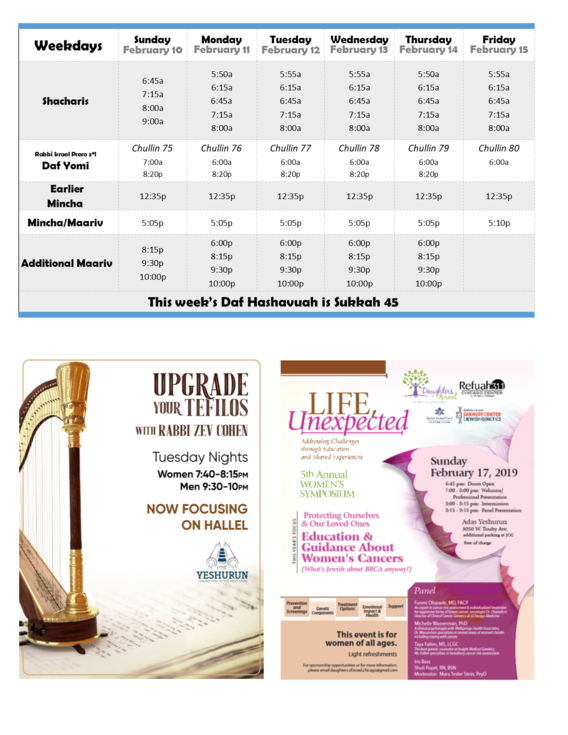 If you would like a printed copy, please contact the shul office. Bnos Tzion will be meeting on Sunday night, February 10 from 8-9 pm, with Rabbi Yaakov Robinson who will be speaking on the topic, "Is Judaism 'All or Nothing'? A Guide to Personal Growth and Fulfillment". In honor of Jewish Disabilities Awareness Month, Libenu is collecting cleaning supplies and toiletries for our homes throughout all of February. Please bring unopened paper towels, tissues, dish-washing soap, toothpaste, etc. to drop off in the red box in the main hallway upstairs. Your help makes a world of difference. Questions? Email Metuka at metuka@libenu.org. 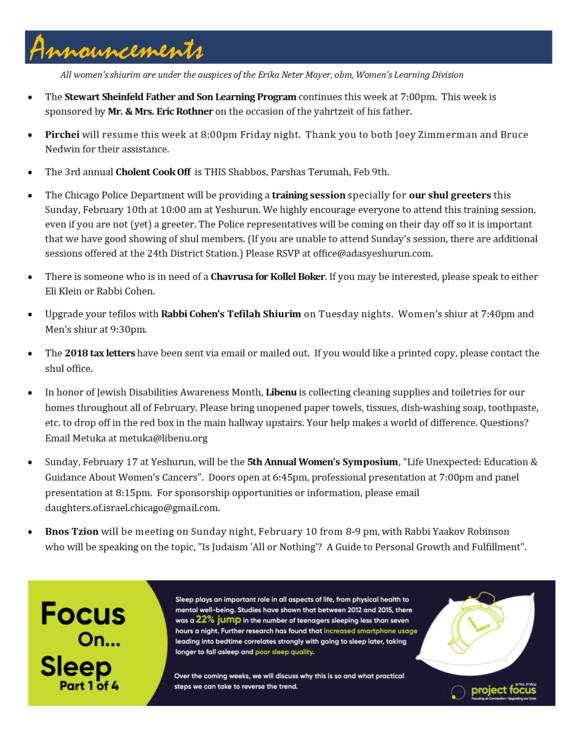 Sunday, February 17 at Yeshurun, will be the 5th Annual Women’s Symposium, “Life Unexpected: Education & Guidance About Women’s Cancers”. Doors open at 6:45pm, professional presentation at 7:00pm and panel presentation at 8:15pm. For sponsorship opportunities or information, please email daughters.of.israel.chicago@gmail.com.